More than 100 children from the Paediatric Ward of Hospital Raja Permaisuri Bainun were overjoyed with the visit of DYMM Raja Permaisuri Perak Tuanku Zara Salim to distribute early Raya goodies to them. 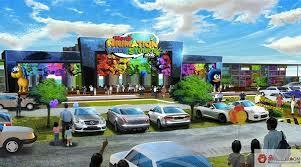 The event was organized by Movie Animation Park Studios (MAPS) to share the spirit of Ramadan with the children. 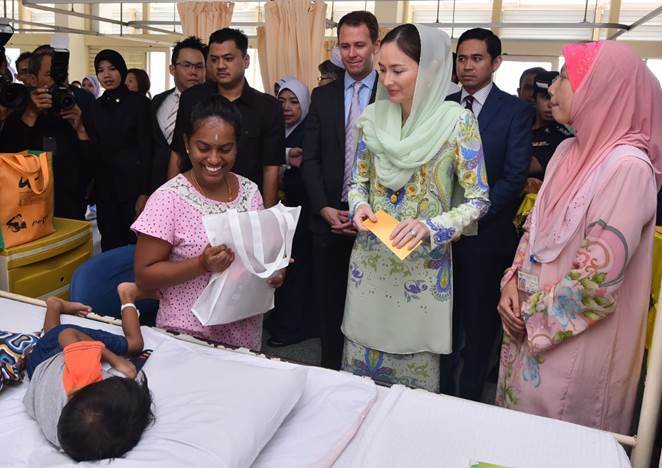 The Chairman of RSG Group and Founder of MAPS, Ramelle Ramli said that MAPS is delighted to be able to contribute some Raya goodies to uplift the mood of the children who are unable to ‘balik kampung’ while they are receiving treatment at the ward to expedite recovery. 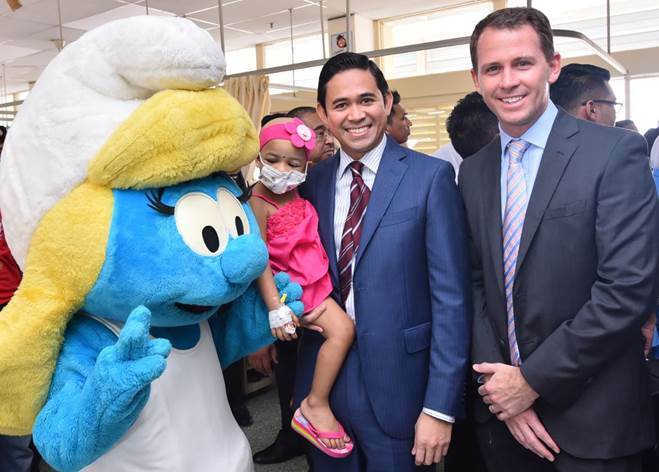 To enhance the Raya festivities, MAPS has also arranged popular The Smurfs costume characters appearance to compliment the hospital visit. 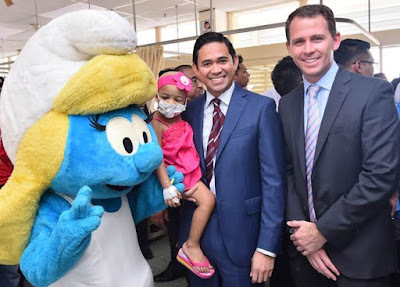 ‘It is truly rewarding to see the children beaming with joy as they get the chance to interact with their favourite The Smurfs characters while receiving Raya goodies from Tuanku Zara, we hope this will speed up their recovery too,’ added Ramelle. Co-Founder and Chief Executive Officer of MAPS, Darren McLean added that MAPS will continue the efforts to reach out to the community and inspire them to ‘Live Their Dreams’ through #MAPSweCare Corporate Social Responsibility (CSR) Programme focusing on education, training and development and community engagements for the benefit of young Malaysians. Later in the evening, MAPS hosted a ‘Majlis Berbuka Puasa’ with the special children of Sekolah Semangat Maju, Ipoh. About 200 special children, media and guests were treated to scrumptious Raya delicacies to mark an early Hari Raya Aidilfitri celebration. To elevate the Raya mood, the children and guests were entertained with special appearance of ‘Papa Smurf, Smurfette and Clumsy Smurf dressed in Baju Melayu’, followed by a magic show performance. 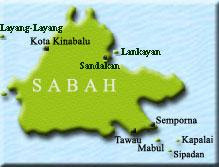 MAPS goodies were also distributed to the children at Sekolah Semangat Maju, Ipoh. 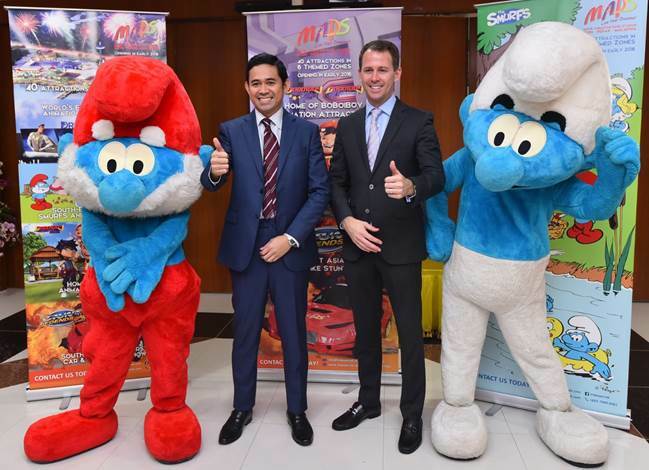 Poised as Asia’s first animation theme park opening in 2016, built at the cost of RM450 million, MAPS will showcase a diverse portfolio of key attractions alongside with The Smurfs such as DreamWorks Animation's Mr Peabody and Sherman, Megamind, The Croods and Caspers the Friendly Ghost, including Home of BoboiBoy and Stunt Legends - South-East Asia’s first Car & Bike ‘Live’ Stunt Show among others. 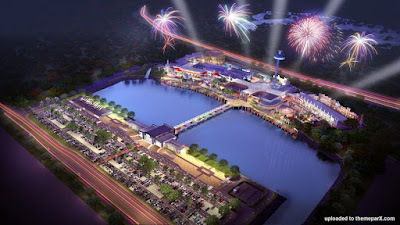 Movie Animation Park Studios (‘MAPS’) is currently one of the most unique and exciting projects underway in the leisure and tourism landscape in Malaysia. Developed & managed by Animation Theme Park Sdn Bhd, a joint-venture between RSG MAPS Sdn Bhd and PCB Development Sdn Bhd (wholly owned subsidiary of Perak Corporation Berhad), MAPS Perak is poised to be the ‘First Animation Theme Park in Asia’ upon its target completion by mid 2016.